Camp Augustine is a 160-acre camp along the banks of the Platte River between Grand Island and Doniphan, Nebraska. It offers summer programs throughout June and July and is open the rest of the year for events and unit camping. Cabin 1 is a basic bunk cabin with sleeping for 10, heat and A/C, table and chairs, and a sink for hand washing. Cabin 2 is a basic bunk cabin with sleeping for 10, heat and A/C, table and chairs, and a sink for hand washing. Cabin 3 is a basic bunk cabin with sleeping for 10, heat and A/C, table and chairs, and a sink for hand washing. Cabin 4 is a basic bunk cabin with sleeping for 10, heat and A/C, table and chairs, and a sink for hand washing. The Visitors' Center is a modern building with restrooms, a full kitchen, a common room that can seat 32 at tables or up to 50 without tables. It has wireless internet available. Full commercial kitchen located in the dining hall. Is air conditioned, but not heated. The Dining Hall can seat up to 200. It has a PA system and fireplace. Chinook is a medium-sized campsite located between the Outdoor Skills area and the Rifle Range. Crazy Horse is a medium-sized campsite located along the river just south of the Shower House. Fort Epp is a large campsite located east of the swimming pool. Hamilton County is a small campsite north of Tipi. It does not have a latrine nearby. Pawnee is a large campsite north of the parade field. Perry Schafer is a large campsite located along the river just south of the Shower House. It uses the latrine in Crazy Horse. Polaris is a large campsite located north of Chinook. Sertoma is a smaller campsite located just south of the Thompson Trading Post. Sioux is a medium-sized campsite just east of the Chapel. Standing Bear is a small campsite located just south of the Shower House. It uses the latrine at Crazy Horse. Tipi is a large campsite just to the north of Fort Epp. It shares a latrine with Fort Epp. War Axe is a large campsite located along the river just to the southwest of the parade field. Canoes are available with paddles and life jackets. Group must show proof of Safety Afloat training before using the canoes. Kayaks are available with paddles and life jackets. Group must show proof of Safety Afloat training before using the canoes. Bosselman Pavilion seats up to 64 and is located near the Dining Hall. It has electricity and lighting. Donut Lake Pavilion seats up to 16 and is located near the Dining Hall. It has electricity and lighting. Eagle Lodge has seating at picnic tables for 16 plus benches around the perimeter that can seat an additional 32. It has electricity and lighting. The shower house has 4 separate sections, each with its own toilets, sinks, and showers. It can handle up to 140 youth males, 60 adult males, 60 youth females, and 60 adult females simultaneously. An 8-station archery range with a sheltered shooting area. The Campfire Bowl is located just off the parking lot and has a stage, electricity, lighting, and seating for up to 250. The chapel is located along the river and has an altar and seating for up to 100. Our climbing tower is 27 feet tall, and has 4 sides with different difficulties and challenges. The Ecology Area has a pavilion and picnic tables as well as a great space for activities. The lakefront can be used for fishing, picnics, canoeing, kayaking, etc. The OA Callout Site has two fire rings and seating for up to 100. The Outdoor Skills Area is an open area with multiple fire rings and picnic tables. The rifle range can accommodate 8 shooters at once on the shooting line. The swimming pool is a large pool with a capacity of 147 persons. Its depth ranges from 3 feet to 9 feet. You must also rent the Shower House if you use the pool. The Trail to First Class area is a small program area with picnic tables and campfire rings. Continental breakfast provided by our food service staff. Hot breakfast provided by our food service staff. Lunch provided by our food service staff. Supper provided by our food service staff. The rental group agrees that the group will abide by the Facility Use Policy and any and all instructions of the Camp Ranger and/or his designee. The rental group agrees to provide a minimum of two (2) adult leaders, one of which must be 21 years of age or older. If a Scouting group, every adult must have completed Youth Protection Training. At least one adult must be present with the group at all times while at the facilities or in camp. 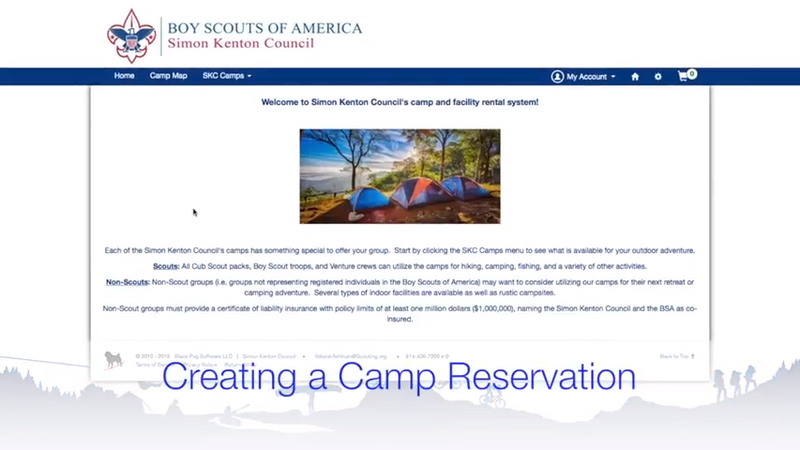 While Scouting makes every effort to accommodate all persons with disabilities, the Boy Scouts of America (BSA) is a charitable, private organization not subject to the Americans with Disabilities Act (ADA), and any group who uses the facilities or camp is responsible for ADA compliance and any accommodations necessary for its participants and attendees. The local council Scout Executive (hereby referred to as "Scout Executive) or his/her designee is responsible for granting permission to use local council property, for the rules and regulations governing use, and for the rental charges to be paid. Local council property will be rented for other than Scouting purposes only when there is no interference with Scouting activities. Application for use of council facilities is to be made online. A credit card will be taken at the time of reservation and full payment will be made at the end of the rental. In addition, if there is any reason to believe that the use may involve damage beyond that of ordinary wear and tear, the Scout Executive may require advance payment against loss. 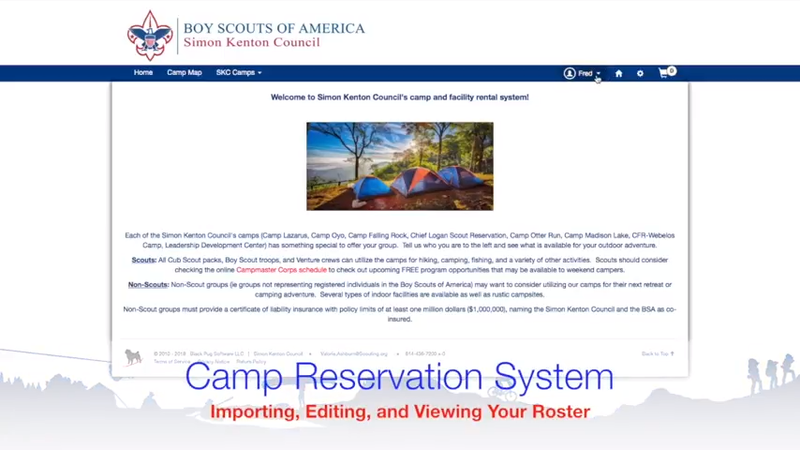 The Scout Executive also reserves the right to revoke the reservation for cause. Automobile Liability: $1,000,000 (if rental group and/or contracted vendor has owned vehicles on council property). Workers Compensation and Employers Liability (if rental group and/or contracted vendor has paid employees on council property). The BSA has established a program for non-Scouting groups to purchase individual event insurance coverage. If the rental group cannot provide proof of insurance, a separate insurance policy can be purchased through the local council. The cost of coverage will be added to rental fees for the activity or event. Smoking or tobacco use, alcoholic beverages, or illegal drugs are prohibited in any part of the Scout facilities or camp property. The reservation does not permit use of any machine, apparatus, equipment, or tools owned by the local council unless it is rented as part of reservation. Rental groups should confer with the Ranger and/or appropriate Service Center staff member to obtain permission to bring materials into rented spaces. The local council assumes no responsibility for damage to property of others. All laws regarding public assemblies and local council rules and guidelines must be strictly followed. Any camp or facility used by the rental group will be examined carefully after use, and the rental group agrees to leave the area(s) used in a clean condition. The rental group make good for any loss or damage above and beyond normal wear and tear occurring during the rental group's use of said area or equipment. Any decorations or equipment of the rental group must be promptly removed from the facilities or camp after the rental so as not to interfere with other activities. If there is a delay, the removal will be made by the local council at the expense of the rental group. In the event of any dispute or controversy regarding the meaning of anything contained in the rental documents and/or Facility Use Policy, the decision of the Overland Trails Council will be final. By agreeing to this policy, the responsible party of the rental group hereby acknowledges that he/she is responsible for the use of the facility, camp, or equipment rented. He/she further acknowledges that he/she has reviewed and understands the rules and regulations contained herein, and agrees to comply with all. He/she understands that failure to comply with the aforementioned rules will jeopardize any future opportunities to use local council facilities an/or camps. Upon arrival, go to the camp office, which is at the south door of the Visitors' Center. Ranger or his designee will check you in and finalize any fees as well as confirm your appointment for check-out. Proceed to your reserved campsite or reserved building/area. Clean up the facility or facilities used by your group to a state better than you found it. Text or call Ranger when you are ready to check out and have the facility or facilities inspected. Ranger or his designee will inspect the facility or facilities and note any new damage or failure to clean. If there is an issue with cleanliness, you will get an opportunity to correct it. Upon completion of the inspection, you will be notified of any issues that may cause additional charges. Please take all trash to large enclosed dumpster near the Dining Hall. Cancel anytime before 14 days prior to your check-in date, and you will receive a full refund. After 14 days of your check-in date, but not within 7 days of your check-in date, 50% of the registration cost will be refunded. Once within 7 days of your check-in date, there will be no refund. No-shows forfeit all fees paid and will be invoiced for any fees not yet paid. Reservations may be rescheduled if notified more than 7 days in advance. Rescheduled dates must be within 12 months of original reservation. Full refunds will only be granted in the event of the camp being closed for any reason. A Scout is clean and respectful. Facilities used at camp should be left as they were found or better. If the facility was not left clean, a cleaning fee will be charged to your final bill. Your group is responsible, and will be charged, for any damages that didn't arise over the corse of normal use. Report all needed repairs to the Ranger or Campmaster immediately.